Please restrict any comments on the Harper negotiations to this location. Hopefully, this is the last time I need to post this. Please restrict any comments on the Machado contract or Harper negotiations to this location. Like Phillies’ fans and the baseball world, I am at a loss for words over the horrible incident that took the life of Roy Halladay. Initially, I resisted the impulse to write something about this remarkable man. I couldn’t find the words. Then I received this from my friend, Steve Potter. It was so wonderfully expressive, that I felt it needed to be shared. 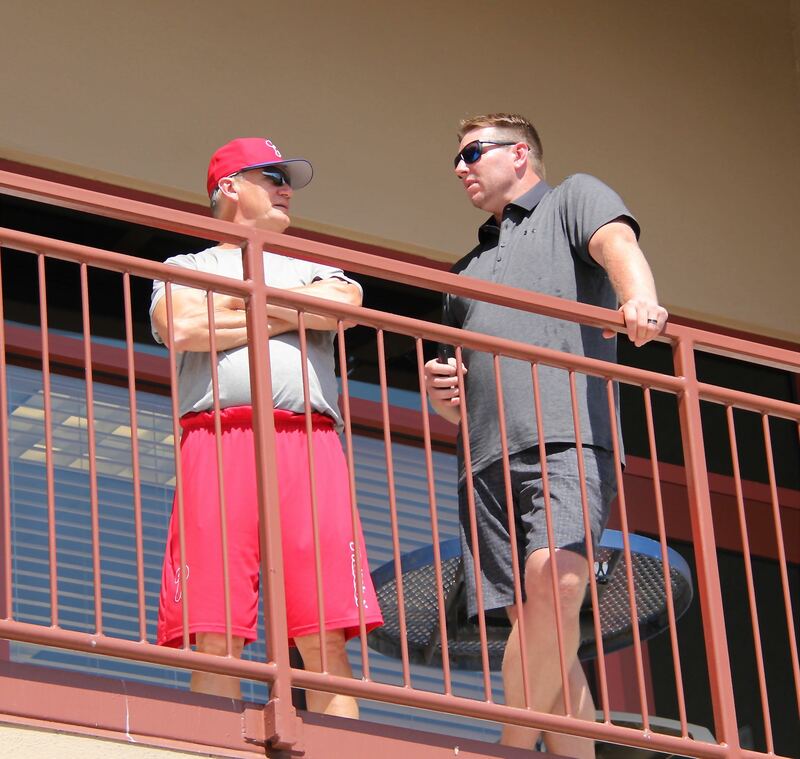 Like Steve, I had seen Halladay at the Complex during the summer. He worked with pitchers during extended spring training and returned later during the GCL season and into the Instructional League. He arrived early, and worked behind the scenes. Sometimes, the only evidence that he was there was his vehicle in the parking lot. When I finally asked a Phillies’ official about Halladay’s involvement with the team, I was told that he did come to the Complex but that he couldn’t comment further. He hoped that something official could be reached and announced. The last time I saw Halladay at the Complex, he came out of the clubhouse to watch an ongoing game. Maybe because we spotted him, he retreated into the clubhouse and re-emerged on the second level. The picture below shows him talking to Dickie Noles, the last picture I took of him. Here is Steve Potter’s tribute. When you’re a sports fan the players who represent your chosen team often times become bigger than life in your eyes. The games in which they participate, especially the ones where they excel become embedded in your memory. If they win a championship or get your team into the playoffs they become legendary, especially if your team doesn’t usually win all that many games. As Phillies baseball fans we’ve suffered more than our fair share of losses and the accompanying heartache. We’re known collectively as demanding and critical but also as loyal and passionate. When a player wears our colors he becomes ingrained in our desire to succeed and we especially endear those who have great work ethic, passion and desire to win. These men become our heroes and are revered. We hold them in awe and high esteem. Roy Halladay held such reverence in Philadelphia amongst us fans. He wanted to play here, he wanted to win more than anything and he worked harder than anyone to produce a championship. He was also a man of compassion and served the community via charitable action, mostly unpublicized, thru various off field endeavors. I just saw him a few weeks ago in Clearwater at the Complex during Florida Instructional League play. He was up on the observation deck watching the game that day. I never had the pleasure of talking with him, never got to know him but as a fan felt like I did anyways. This past year or so he was a regular at the Complex working with the minor league players in Spring Training, Extended Spring and also with those on rehab. I’ve read many of their testimonials to Roy the past couple hours on Twitter in how they were honored to be mentored by him on the skill of positive thought. That was primarily his role, he was a disciple of mental toughness and envisioning success to make it happen. He used it himself to reinvent his career after early failure. Roy coached his sons and their teams in baseball as well, just recently he had posted on Twitter about a 12 and under tournament championship and how proud he was of the kids. He coached at a local high school and they also won a championship. He loved to fly and also posted Twitter items on that as well. Recently he had gotten a new plane, the first of its kind from what I gather and he was very proud of it and the experiences it gave him. He posted multiple pictures and even a video of how the views were breathtaking. From what I could gather he took the plane up at every chance he got, he even stated his wife didn’t want him to get the plane but he convinced her it was “all good” and that even she was enjoying the flight experiences. He seemed really excited and happy when flying from the posts he recorded. Today we were at Spectrum Field watching the Men’s Senior Baseball League tournament play when I got a text from a friend quoting a local tv report that Halladay’s plane had crashed. We found out later he had died in the crash. Even though I never truly knew him my heart sank, no doubt every Phillies fan heart did the same. I wasn’t going to write anything about it as I really have no words to express my sincere grief for Roy’s family, especially his wife and two boys. I can’t imagine what they must be going thru right now. It’s so very sad. As a sports fan the players become bigger than life in our eyes, when something like this happens it brings home the reality that they are mortals just like us. We grieve the reality of their loss, it’s disheartening and sudden and oh so sad. It’s part of the cycle of all our lives that’s inevitable but we are never truly ready for. Time will help heal our sadness, our memories help us cope. We fans feel the loss almost as if it’s our own family. In our minds and hearts it is. To the Halladay Family my sincere and heart felt condolences, to our Phillies organization as well. To my fellow Phillies fans I too feel your sadness and loss, we are indeed all family and we’ve lost one of our best. Together we grieve. Thank you Roy for what you gave us, May you Rest In Peace, that ball team skipper in Heaven just brought home another ace.